Here's something different, but not out of the ordinary. Belldandy, in red. It was something different to try out and i think it came out pretty well. Also, the original pic had Bell's eyes closed. So i decided to draw in bell's eyes myself, cause they are pretty eyes and it's a shame to hide them. I just hope that it looks good to everyone else. I think they look great and not out of place.. but then i am biased. The sky also changed color from red to blue, making a warmer wallpaper.. This is one of my favorite pictures of belldandy. The background matches perfectly with what she is doing. The colors are very beautiful. You definately managed to give that wallie a warm touch, red was a very good choice, and the title summarizes the whole image well. I like all the background, the clouds and the light, but that pink shape behind Belldandy looks a bit weird. Good job on that one. Keep it up. really interesting change from the usual blue belldandy walls ^-^ u managed to carry it off nicely too! nice and rosy with a warm feel. gambatte! The red was what drew my attention to this wall. I love how you changed the colors - I totally believe Belldandy looks awesome in red. And great job on drawing in her eyes. Wah, is this one of the new wallpaper sizes, looks so square. :nya: does fit great here, great cloud background, great quality and the red color of the dress is a good idea. 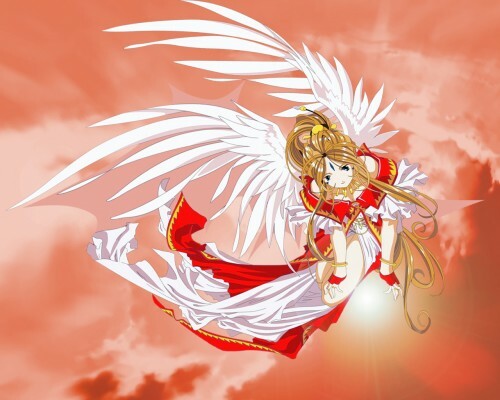 this is a very beautiful wallpaper of belldandy! great colors and looks really pretty! great work! i really like your wallpaper... the pinky background makes it look very warm... it actually does kinda look like the sky does at sunset! great job! This is absolutely beautiful! Great job! Belldandy really stands out against the background. Thank you very much for this one! Well i did not know it was this person's Vector. i found it on 4Chan. I originally thought that logo was part of her dress, that's why it was left in. At least now you mentioned, i can remove the logo on my personal version of the wall. must say it looks nicer in a way. Thank you. And my appologies for Kuragari for using his Vector and not crediting him for it. At the time, i did not know it was his work. love the color! keep up good work!